'Where Does My Money Go?' Goes international. Welcome to OpenSpending. This post is by Friedrich Lindenberg, one of the developers working on OpenSpending. Our primary goal has to be to grow WDMMG as an open platform, similar to Open Street Map: while on OSM you sketch out your local streets, WDMMG should become the place to upload and analyze your local or state governments spending. Therefore, our priority has to be providing the right tools to allow people to contribute to this effort themselves: either by loading data, annotating spending or visualizing it in custom ways. 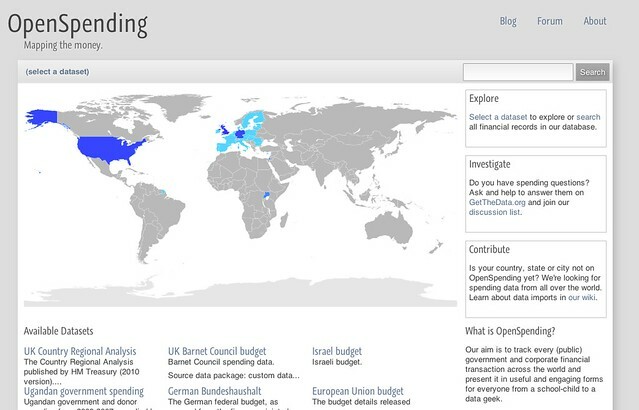 As such transparency is needed not only in the UK but all over the world, we want to re-label the data part of the site (what is now data.wdmmg.org) to the more international OpenSpending. This would both serve as an accessible means to handling financial data and as a backend to more specific sites, such as the UK’s WhereDoesMyMoneyGo visualizations and Germany’s OffenerHaushalt. I’d like to invite all of you to follow up on the remainder of our discussion, which is archived at http://wiki.openspending.org/Status_2011-02-10 and to contribute your own thoughts.